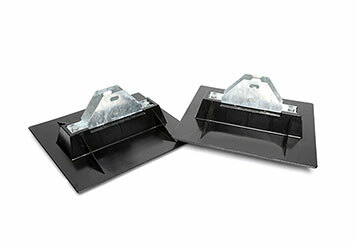 PRODUCT: Miro 8SHB Base, Strut-Support Tiltable Base and Bracket. Also called a rooftop sleeper support base. Connects to 1-5/8 steel strut. Base is 16x18 in. square x 2-5/8 in. high (at bottom of support bracket). Price/Each. Bracket connects to 1-5/8 x 1-5/8" steel channel strut. Polycarbonate base is 16x18" square x 2-5/8" high, for low slop rooftop applications. Galvanized steel bracket with mounting holes(no bolts included). Mounting bracket is slotted to tilt, and allow up to 2:12 slope.